This sweet homemade apple cider is lightly sweetened with maple syrup and is made totally from scratch – no apple juice here! Naturally gluten-free, vegan and dairy-free. Mr. T has been on an apple buying spree for the past two months. All of a sudden, he’s interested in trying every variety of apple out there so when they’re on sale, he comes home with a few pounds (which is how they’re sold). Now I have about 20 pounds of apples and can’t get rid of them quickly enough! This homemade apple cider could alternatively be called “What To Make When You Have Too Many Apples.” I wouldn’t use fancy or expensive apples in this cider just because it seems like such a waste – any old apples will do! They tasted exactly the same, so if you have old apples, use them! Just make sure that they’re still good and flavorful. If you use apples that taste like nothing (looking at you, Red Delicious!) then your apple cider will also taste like nothing. Or actually, it’ll taste like cinnamon maple syrup water, which doesn’t sound that bad, but it’s not what we’re going for here. I made it a second time because my yield seemed so much smaller than what I’d seen online. Some recipes were claiming a yield of 1 gallon from only 10 apples. A gallon! I did use small apples but I still don’t see how that’s possible. This is another case for adding weights to recipes. ;) American apples must be much larger than I remember. I sweetened my apple cider with just 3 tablespoons of maple syrup and it was perfect for us. That’s much, much less sweetener than other recipes so you may want more. You can always add more maple syrup, sugar or whatever sweetener you want to use later on, but you can’t remove it, so I recommend using 3 tablespoons and adding more to taste when it’s finished. Core the apples and cut into 1" slices. I like to use something like this to core and slice at the same time. Place the maple syrup, cinnamon sticks and allspice in a large lidded pot. Add the apples and then cover the apples with 1" of water. Give it a good stir. Cover and boil on medium for 1 hour, checking occasionally to make sure the apples aren't sticking. Add water, as necessary. If using old apples, be sure to check every 15 minutes. After one hour, check the apples, and stir. Turn the heat down to low and continue simmering until the apples almost completely broken down (about an additional hour). Remove from the heat. Let the apples cool for an hour or until cool enough to touch. Remove the cinnamon sticks. Get out a jug or whatever storage container you'd like to use. Directly over that container, strain the apples through a fine mesh sieve or use a clean tea towel or cheesecloth to wring out the liquid. Taste and add sweetener and / or more spices to taste. Let the cider cool to room temperature and then cover and refrigerate. Can be stored for up to 3 days. 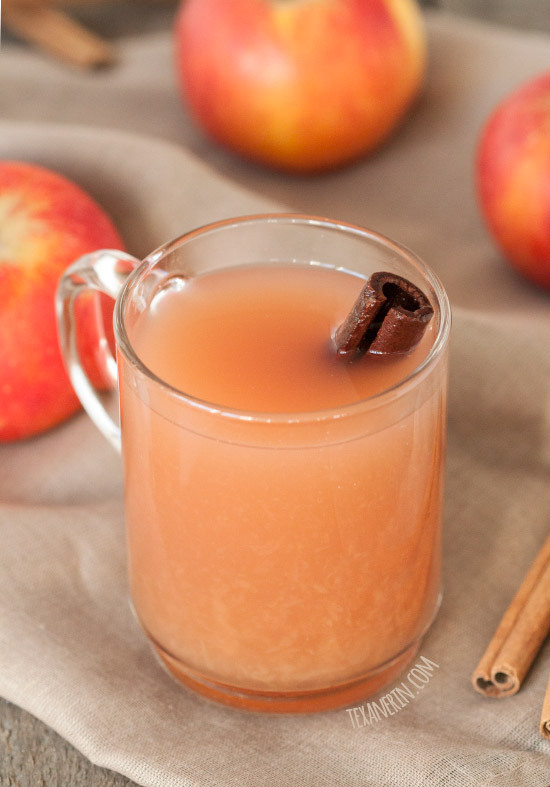 36 comments on “Homemade Apple Cider (naturally sweetened)” — Add one! I love that you sweetened this with maple. YUM! This is fantastic! I always have a lot of apples around the house now for my toddler so making cider out of them will be a great way to welcome in the holidays! Wow! I’ve never thought to make apple cider before and now I have an excuse to get some apples and try it! 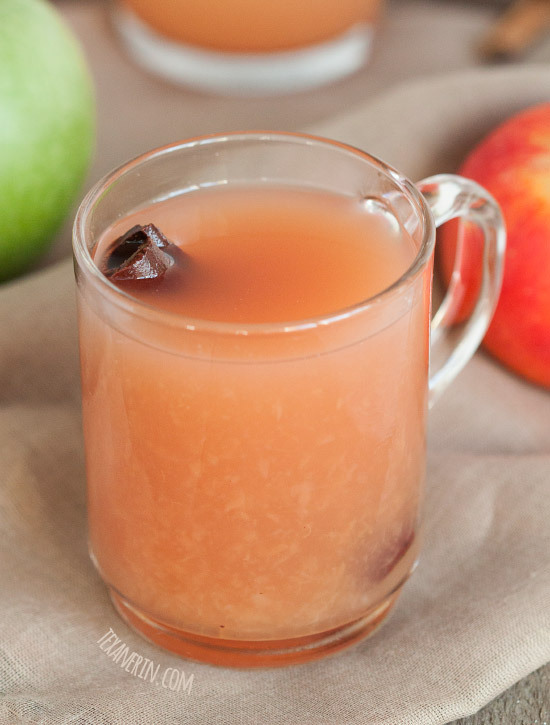 There is nothing like homemade apple cider – looks fantastic Erin! There is nothing like a piping hot cup of homemade apple cider when it is cold out and it is FREEZING here! I wish I could share! Apple cider is my favorite fall beverage…but I just buy it from the mill. You’re making me look bad. ;) Seriously though, I have to try this, my family of apple-lovers will rejoice! That’s cool that the more mushier apples yielded same taste as the more fresh apples. I’d love a cup of hot apple cider this chilly morning!! I have made homemade applesauce but not cider! This looks so delicious! Just a lovely recipe, Erin! I think it would be perfect for sipping after dinner on Thanksgiving. My hubby is a big fan of apple cider as well and I really had no idea how simple it was ot make at home. Love how you share your testing and the differences, really helpful! Such a great holiday beverage! I had SOOO many apples from my parents’ tree this year and it would’ve been a fantastic use for them! I Loooove apple cider. And apples at the store can be MASSIVE. I’ve seen apples that were well over half a pound each. I love how healthy this recipe is for a holiday beverage, Erin! Thank you! I hear you about red delicious – I’m not certain why anyone eats them. The cider sounds wonderful. FYI, when I clicked on the link for the apple corer/slicer, it took me to an ice cream maker… thought you might want to know. Thanks, Susan! One reader told me that non-store bought Red Delicious are actually yummy so maybe we’re missing out. We’ll just have to find someone with a Red Delicious tree. ;) And thanks for letting me know about the link! It’s fixed now. Such a delicious cider. My little sister is crazy for it, and I can’t wait to try this recipe at home! Delicious! I think I would love to attempt apple cider for the first time! Great recipe!